The Royal Enfield Continental GT 650 is available in 1 variant and five colors. 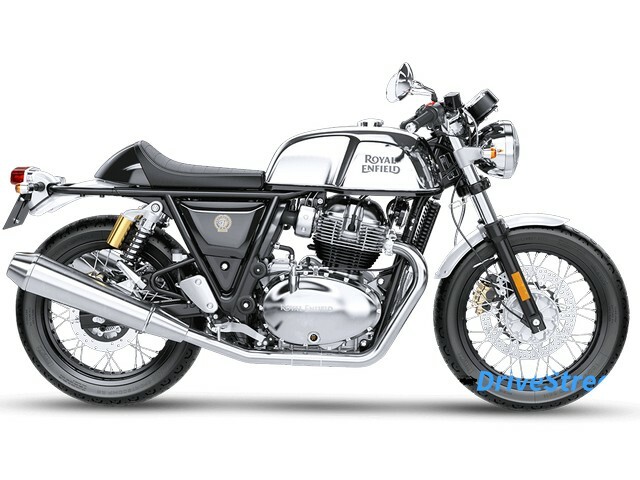 Check out Royal Enfield Continental GT 650 prices, specifications, colors, features and mileage. Our detailed Royal Enfield Continental GT 650 comparison helps you compare the bike with its competitors. DriveStreak brings you all the information about Royal Enfield Continental GT 650 to help you make the right buying decision. The Royal Enfield Continental GT 650 borrows its styling cues from the original bikes of the sixties and seventies. The bike`s design is similar to its smaller sibling the Continental GT 250. The underpinnings are completely new and have been developed by Harris performance (UK). RE has ensured that the bike offers a balance of both riding comfort and Handling. The twin exhausts in chrome adds to the classic look of the motorcycle. Powering the Royal Enfield Continental GT 650 is a 648-cc parallel-twin engine which pups out 47 BHP of power @7250 RPM and 52 Nm of twisting force 4000 RPM paired to a six-speed gearbox with slipper clutch. Compared to the Interceptor 650 the riding position is quite aggressive, which might take a toll on the rider`s back on highway trips. Key features of the Continental GT 650 include ABS, front and rear disc brakes, dual exhaust pipes, basic twin pod instrument cluster and clip on handlebars. On tape the bike measures 1024 mm in height and ground clearance is pegged at 174 mm. The Continental GT 650 is available in 5 colors – Black Magic, Ventura Blue, Mister Clean, Dr. Mayhem and Ice Queen.